And what to buy from it online. If you believe beauty is wellness, and thus wellness is beauty, then let me intro you to your beauty mecca: CAP Beauty. 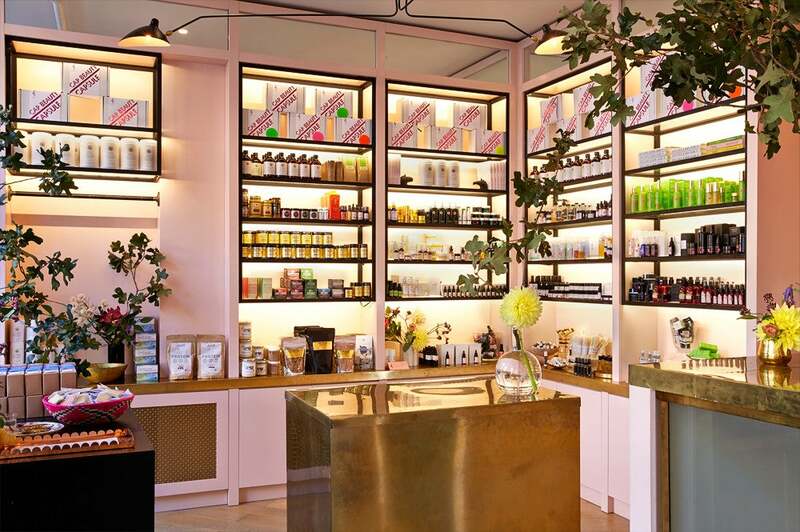 The three-year-old West Village shop has been quietly curating the greatest and most selective collection of natural skincare, makeup, and pantry items. Created by friends Cindy DiPrima Morisse and Kerrilynn Pamer, both of whom have backgrounds in food, design, and fashion, CAP opened up their second location in the newest Fred Segal in Los Angeles last year. The design of both spaces features elegant, but edgy, earthy tones with pale pink, and high contrast accents with pops of lustrous metallics. And on those well-designed shelves sit items meant to make you authentically glow from within, from adaptogens to ‘Golden Turmeric’ to hard-to-find organic skincare. Their tiny shops are packed full of items so unique and individual that the curation knows no equal. But the items aren’t just for show—each skincare, makeup, and pantry item is selected not because its ingredients or packaging is trendy or eye-catching, but because of its effectiveness. They cut through the BS in wellness, finding the true gems. If they sell it, it works—simple as that. Beyond just epic curation, they also have their own line of pantry items, from matcha to-go in clever graphic packaging to the highest quality CBD oil to their just-launched colorful coconut butter trio. Speaking of glowing from within, they also have a blog with interviews and recipes, like an epic roasted carrot recipe to a clever vegan swap for eggs. Both Morisse and Pamer have made wellness a cornerstone of their lives for decades, which also inspired their new book High Vibrational Beauty, out April 3. And if that all wasn’t enough, they have hidden treatment rooms in the NY destination that provide the most extraordinary facials and acupuncture in all of NY. I came in for The Alchemic Facial, which utilizes high-frequency In Fiore’s products, and is dedicated to a lengthy, effective face massage. After the treatment, as I sipped a cacao adaptogen mixture, my therapist Crystal said she looks at each facial as a meditation, and puts intention into every single movement she makes. And the truth is, I’ve never experience a more loving facial, which is something I never even knew existed before CAP. And, the morning after, I’d never looked more well-rested and glowing. Crystal also sent a lengthy email detailing the most effective regime for my skin type, along with some dietary suggestions based on our conversation (grabbing an omega supplement ASAP, based on her rec). But even if you’re not in New York or LA, you can reap the CAP benefits. Every single product is available on their website. We zeroed in on our favorite items (in all honestly, we could have just pointed you to everything), which cement them as one of the greatest sources for beauty curation, natural or not. Handcrafted in Brooklyn, this body oil is a grounding, heady mix of five essential oils, meant to calm the body and mind. No harsh chemicals needed, this natural powerhouse cleanses and balances hair in minutes. Use whenever bouncy, healthy hair is needed. Facial rollers are all over the place now. But some are of much higher quality, this one is made from ethical crystals, perfect for an at-home facial massage. Handmade in upstate NY by the coolest couple around, this raw honey has a bevy of benefits and uses—from tea to facials. Talk about flower power, this orange blossom, rose, and calendula formula cools, brightens, and hydrates without irritation or gross chemicals. One of the most beloved skincare brands in natural beauty, Veronique’s day oil is the perfect intro product for those wanting added moisture and supported, healthy skin (thanks to omegas 3 and 6, carotenoids, and fatty acids). A healthy mix of ingredients (camellia, manuka honey, mango butter, and rose wax) make this lip balm of the best things you can swipe on your lips. We never knew we wanted/needed a tongue scraper until we heard this can “remove toxic residue from the body” and “heighten your ability to taste, thereby discouraging the addition of unneeded sugar.” Sold!